38 PC. 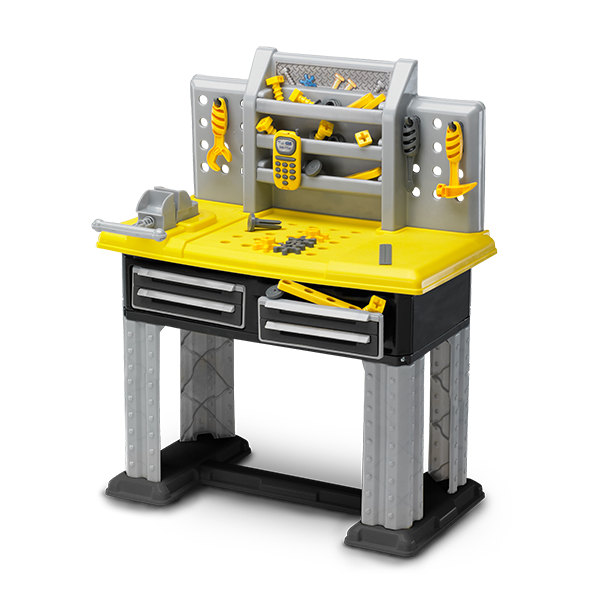 DELUXE WORKBENCH | American Plastic Toys Inc. The ideal workbench for a little builder! It features two storage drawers, a peg board, three hooks for hanging tools, and tools galore. The accessories include a battery operated reversible drill (batteries not included) with two drill bits, a hammer, wrench and screwdriver, four nails, six bolts, six nuts, five interlocking gears, five connector brackets, a cell phone, and a ruler. Packaged in a full color box.